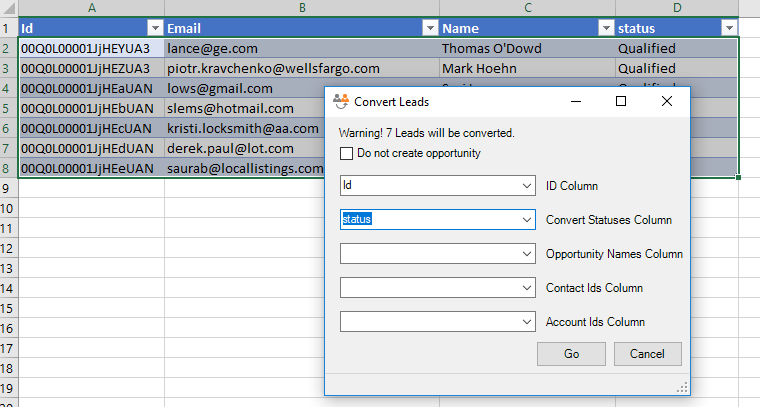 As a minimum, you’ll need to select which of the columns contains Lead Ids and Lead Statuses. Optionally, you can have a column of Account Ids and a column of Contact Ids in your data. Rows with Ids of existing Accounts and/or Contacts will be converted to the specified Accounts and/or Contacts, for rows without the Ids there – new Accounts and Contacts will be created. If you don’t have a column of Account and/or Contact Ids – they will be created for all records.